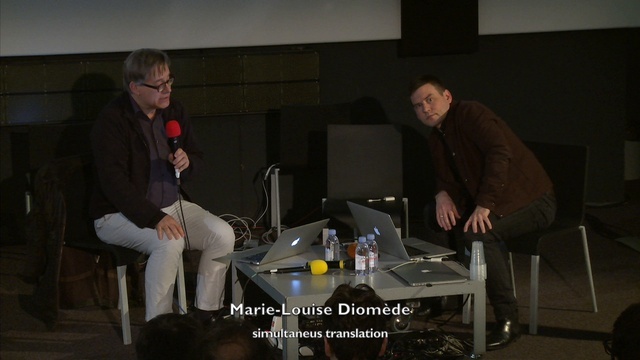 Simultaneus traduction : Marie-Louise Diomède. Music and Architecture maintain a set of metaphorical as well as temporal and spatial interactions. Sound spatialization means not only extending the organological body with new sounds, but also modulating the acoustics of the concert hall. It means even creating chimerical spaces. It makes it possible to capture, compose or reproduce the sound fingerprints of spaces, engraved in spatialized impulse responses. A virtual sound chamber is formed in the concert hall, allowing an artistic game with the ambiguity of these competing acoustic spaces. After a brief survey of available technologies, we will identify different possible aspects of sound spatialization. Based on the examples of creation of the exhibition "Imprimer le monde", we will identify approaches that aim to reveal and "translate" a pre-existing architectural space while others aim to "re-produce" the sound impression of certain spaces.